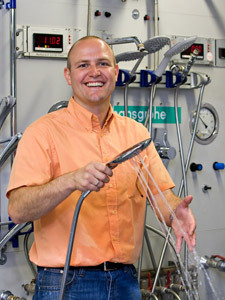 In his capacity as a spray researcher, Markus Wöhrle records scientific observations on water jets together with his team. At the spray laboratory special unit, where he works at Hansgrohe, he documents the results and derives new shower functions from the results collected. His tasks also include developing methods for inspection and testing procedures. For example, for tests in the new limescale laboratory, for enhanced spray pattern measurement or for the creation of functional models. Markus Wöhrle – so how does one become a spray researcher? Markus Wöhrle: The job description was created here at Hansgrohe. It was created out of the desire to learn how to understand water. And to do this not only using already scientifically proven formulae, but rather as a result of observing, experimenting and innovation. There is a long tradition of this at Hansgrohe. Spray researchers try to figure out exactly what can be done using jet sprays. We accurately record our experiments and test series, and verify and document them. Can you describe your career path at Hansgrohe? M.W. : I got my degree in environmental and process engineering at Offenburg University of Applied Sciences, so I'm a graduate engineer. I did my thesis on quality assurance and measurement technology at Hansgrohe. I then worked in process engineering and handled the optimisation of materials and processes in respect of manufacturing and building technology. About ten years ago I got the opportunity to switch over to the development division as an engineer and to establish the new "spray research" special unit for water jets. What does your team do Monday to Friday? M.W. : Our passion for water doesn't just start at eight o'clock in the morning and stop at 5pm. It's our constant companion – at work and during our leisure time. Here in the spray laboratory we carry out fundamental research. We observe and examine water jets and their behaviour. We work according to structured test conditions and subject to all the relevant international standards. We have to properly implement these specifications of course. We act on customer feedback. But we also observe lots of things from everyday life. There, and during our everyday work with water, we come across lots of exciting effects, technologies and mechanisms that help us to improve our products. We go through life with our eyes and ears open in order to understand just can be done with a jet spray. How we can use and distribute water more efficiently in future. How do you document your research findings? M.W. : Since we are looking to expand our knowledge and water expertise at Hansgrohe, we consider it extremely important to document all data carefully. We work with the latest media and powerful storage platforms. We now have a ten-year database that contains the analyses from our test runs. So we can draw on the experience that has been gained and we don't always need to start from scratch. That has not always been the case. Thirty years ago there was a one-man spray research program, but of course at that time, with no PC, there weren't the wide range of possibilities that we have today. Is the sanitary research here state-of-the-art, and at the best possible stage of development technologically speaking? M.W. : There's always more to be done of course, but Hansgrohe SE is probably the world leader in this field today. Out on its own, in terms of the team we have here. And with regard to measurement methods, and flow calculations. We work with powder, resins, vacuum foundry, vacuum casting, and manufacture complete assembly groups. We lay out our pre-development components using CAD (editor's note: computer aided design), build 3-D models and create initial samples using the latest rapid prototyping technology. This procedure can be used to produce functional models quickly – particularly when you have to do this using complex inner geometries. We have really taken a quantum leap in recent years. Do you also sometimes do tests on living objects? M.W. : Sure. Here we put our trunks on and stand under new shower jets. Although there are nicer places to be than a technical water testing area with grid flooring. Of course we can also take a shower prototype home with us and check it out at leisure. Every one of us spray researchers has a dual connection for hand showers at home in his shower. Shower and mixer production has lots to do with emotionality and sensuousness, feel good criteria and luxury themes. But how significant is environmental protection in your research? M.W. : Environmental protection and sustainability are more than just catchphrases at Hansgrohe SE. The company has been doing a lot in this area for a very long time: the prevention of harmful substances in manufacture as well as electroplating, recycling, and renewable energies. In spray research our attention is focused on sensible water restriction in order to combat waste. We do not want to be part of the throw-away society, so quality is a clear priority with us here. We produce durable products, and there are many things that can be done to protect the environment and conserve resources. That being said, Hansgrohe began to develop low-consumption showers and mixers very early on. Doesn't Swabian frugality also play a role in this? M.W. : Yes, I believe so. The efficient utilisation of water and energy has always been pivotal to our research work. However, we are continually examining feasibility. In attempting to develop economical showers and mixers, we need to constantly explore our limitations. To what extent can we reduce water consumption so that we still have a good jet that achieves optimum cleaning performance and guarantees the shower comfort we need? Otherwise we'd end up with women standing under the shower forever, trying to rinse the shampoo out of their hair – and that wouldn't be at all environmentally friendly. All this needs to be examined in detail. The ideal is to develop water- and energy-saving products that also offer comfort and have a high feel good factor. Keyword AirPower. This was invented here in the spray research department, wasn't it? M.W. : Yes, originally it was all about the RainAIR jet type. We wanted to create a jet that dispensed droplets similar to natural rain, veering away from the straight jet filaments, the so-called "spaghetti" jets. We wanted a technology where a second medium is added: water assisted by the use of air. We got this idea from the nature of the Black Forest: the stream that cleans itself by mixing air into the water and chopping it up, mostly in the places where it flows quickly and choppily. How is this knowledge transferred to the shower environment? M.W. : The first steps were incredibly simple: speed up the water in the shower head and in so doing drag air into the shower. However, integration into a predefined product design was extremely complex. This is how AirPower works: the ingested air displaces the water, and so less water is needed. The added bonus: less energy is needed to heat up the smaller quantity of water. We also get a completely different spray pattern: the aerated water jet is not only fuller-bodied, but also more varied. Is this air mixing process your department's stroke of genius? M.W. : Amongst others, yes. AirPower has opened up a host of possibilities for us. Incidentally the whole thing came about because of an error. During a test, we suddenly noticed that air had been drawn into one of the showers. Water was not coming out of several of the spray jets. As a result our boss at that time, current Chairman of the Supervisory Board Klaus Grohe, said: "Try and get this effect to work!" So he played a major role in promoting its development. We carried out experiments, changed the number of spray jets, sometimes we made the spray harder, sometimes softer. With AirPower the art is in finding the right cross-sectional ratios. M.W. : Absolutely. All the meticulous innovation work on the aeration of shower water has been worth it. We were the first well-known sanitary company to tackle this issue and we now offer a wide range of products that work with AirPower technology. M.W. : Another invention is the whirl massage, where the jet is converted into a spiral. The advantage of this rotating helix jet is that there is no unpleasant constant stress on any one area of skin. The spray wanders over the skin just like a masseur's fingers. It was hard work, but a great success. The: Raindance hand showers, for instance, now work with a triple helix: three massage jets circulate over the skin. Raindance has become a best-seller and has become a trend, just like a good song. For Hansgrohe it's the number one shower. Everything has come together perfectly in terms of design and water technology. Are there also issues that you are investing money in over the long term and which aren't enjoying instant success? M.W. : There are some basic issues where we just have to keep plodding on and have patience. This means permanent research work, for example on the issue of "highly calciferous water". There are plenty of options in addressing this issue, and we are looking into these in detail in the limescale laboratory. Something like this requires long-term investment, particularly in the case of new developments. This is slow, detailed work which needs to remain efficient, because of course there are also budget limitations. But we already have developments and cleaning technologies that make life easier with regard to this issue, QuickClean for example. M.W. : The spray research department is indeed a forbidden area for lots of people. But we don't work in a bubble here either. That would hamper interchange with other departments and rob us of a portion of our creativity. We are proud of our development work. Imagine what would happen if half-baked ideas or half-developed products were to get out. Our competitors are always on the alert, and these days we need to be able to react rapidly in the current sanitary market. So we keep a safe room here. And in any case every employee is sworn to secrecy. Won't your job be fully exploited at some point? In ten years' time, will you really be coming up with a new kind of water feature? M.W. : I am convinced that this topic is inexhaustible. Water has really still not been properly researched yet. There are still many possibilities, particularly with regard to the sustainable use of water. Development is continuing and becoming evermore rapid. The scarcer water resources become, the more crucial our work is. Grey water recycling and heat recovery, for example, are huge fields. Not to mention the environmental issues: we live in an age where pleasure, enjoyment, quality of life and the luxury of feeling good play an important role in our lives. In this area too, spray research still has a long way to go. M.W. : As an environmental and process engineer, I'm pleased that we have taken this direction at Hansgrohe. I have always wanted to work with water – and in an area where meaningful products can be developed. Products that make the world more resistant, and maybe also do some good. My employees and I pull together with a common goal in sight: we want to use water efficiently, find energy-saving solutions, and develop smart systems like heat recovery, so in short: we all want to do something for the environment on a grand scale. Are you also an innovator in your private life? The interview was conducted by Katja Volkmer, freelance journalist, Munich. Constantly looking for the perfect spray: Markus Wöhrle, head of Hansgrohe spray research.